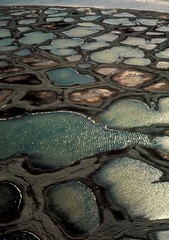 This photo shows an ANWR land feature called polygonal ground. It forms on the Coastal Plain in the freeze-and-thaw process, creating a natural depression that fills with meltwater, surrounded by a berm. Lush vegetation grows on these berms, creating protected cover and forage for snow geese, tundra swans and other waterfowl that flock to the refuge in summer. In winter, this area looks a lot like those photos of barren, windswept ice that are spread with vigor by drilling advocates to suggest that ANWR is a "wasteland." But in summer, the area transforms into this vast network of fragile wetlands, teeming with life. Areas like this could be laced with gravel drilling pads, roads and pipelines if drilling is allowed in the refuge.